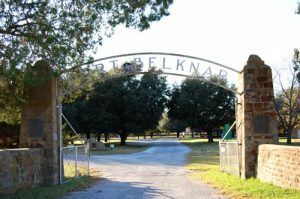 Located three miles south of present-day Newcastle in Young County, Texas, Fort Belknap is one of the many posts along the Texas Forts Trail. Following the U.S. annexation of Texas in 1845, and the Mexican War of 1846-48, Texas frontier settlers began to demand protection against Kiowa and Comanche raids. The Army set up a string of forts: Martin Scott, in 1848; and Worth, Gates, Graham, Croghan, Duncan, Lincoln, the following year. But the rapidly advancing line of settlement soon brought new outcries from the frontiersmen. Another system of forts came into being: Forts Belknap and Phantom Hill, in 1851; and Forts Chadbourne, McKavett, and Clark, the next year. The northern anchor, Belknap, on the Brazos River, was the nearest to the dangerous Kiowa and Comanche country. Besides watching out for settlers, Forts Belknap and Phantom Hill guarded the Fort Smith-El Paso Road, a major link in the transcontinental route pioneered in 1849 by Captain Randolph B. Marcy. Belknap was first established on June 24, 1851, two miles north of its present site by Brevet Brigadier General William G. Belknap. Ordered to build the post, Captain C. L. Stephenson of the Fifth Infantry, directed his men to find water; however, after digging shafts 65 feet deep, they were still unable to reach water and moved the fort two miles south, where adequate water was found in springs by the Brazos River. The first buildings were built of adobe and later replaced with stone. The fort housed four companies of soldiers and was the northern-most anchor in the chain that spread from the Rio Grande to the Red River. The fort did not fit the standard image of a frontier fort since it lacked defensive works such as walls, berms or trenches. Fort Belknap was the base of the expedition of Captain Marcy and Lieutenant George B. McClellan in 1852. This was Marcy’s third expedition, the first tow having originated at Fort Smith, Arkansas. Marcy and McClellan explored the Canadian River and discovered the headwaters of the Red River, the last segment of the southern Plains to be explored. Marcy returned to Fort Belknap in 1854 to help Indian Agent Robert S. Neighbors survey and establish two Indian reservations. The State authorized the reservations in response to Neighbors’ humanitarian efforts, which had begun as early as 1845 and included the negotiation of peace treaties between the Indians and white settlers. In 1854-55 he and Marcy founded the Brazos Agency, a few miles south of Fort Belknap; and the Comanche Reservation (Comanche Reserve), 45 miles to the west, guarded by Camp Cooper. Within three years, more than 1,100 peaceful Indians from various small tribes had settled around the Brazos Agency, but only 400 Comanche moved onto the Comanche Reservation. Under Neighbors’ tutelage, the reservation Indians relinquished their nomadic ways and took up agriculture. In the early 1850’s large numbers of Regulars, often bolstered by Texas Rangers and State troops, did their best to deal with Indian raids, but success was not found until Colonel Albert S. Johnston’s newly organized 2d Cavalry Regiment arrived in December 1855 and dispersed among the forts in the chain. The major offensive involving Fort Belknap troops was Captain Earl Van Dorn’s 1858-59 Wichita Expedition, a march into Indian Territory to retaliate for raids into Texas. Van Dorn led 250 of the garrison’s cavalrymen and infantrymen and 135 Indian allies northward; founded Camp Radziminski in Oklahoma as an advance base, and won victories against the Comanche in the Battle of Rush Springs, Oklahoma on October 1, 1858 and the Battle of Crooked Creek, Kansas on May 13, 1859, near present Dodge City. These aggressive measures caused the Comanche to divide into smaller bands. Many fled to the Staked Plains of eastern New Mexico and the Texas Panhandle, while those remaining near the more populated areas of Texas curtailed their activities. The next year, a regiment of State troops organized at Fort Belknap and pushed north as far as Kansas, but took part in any engagements. In the meantime, the Comanche Indians on the reservation were remaining peaceful, but, this was not always the case with non-reservation Indians. Bitter area settlers blamed the depredations the reservation Indians for the depredations and in July 1859, Indian Agent, Robert S. Neighbors, and troops from Fort Belknap were required to repulse a mob of settlers intent on murdering the reservation inhabitants. Neighbors then realized the only solution was the abandonment of the two reservations, and before long, a squadron of cavalry moved a caravan of Indians to a spot on the Washita River 12 miles west of the newly established Wichita Agency in Oklahoma, protected by Fort Cobb. Upon his return, Neighbors was assassinated by a disgruntled settler in the town of Belknap, founded in 1856, near the fort. Also occurring in 1859, the troops again suffered a major water shortage, the fort was abandoned, and the troops transferred to Camp Cooper. However, the Butterfield Overland Mail Station that had been situated there in 1858, continued to operate until 1861. In early 1861, believing that war was imminent, General David E. Twiggs, in San Antonio, ordered Colonel William H. Emory to gather all federal troops and move them north to Fort Leavenworth, Kansas. On February 9, 1861, General Twiggs surrendered all United States forts and military equipment in Texas. During the Civil War, Confederates of the Texas Frontier Regiment used the post for a base against hostile Indians and for the protection of settlers, but the inexperienced troops could not stop Indian raids. After the Civil War, U.S. troops returned to Fort Belknap in April 1867 and began to restore its buildings. 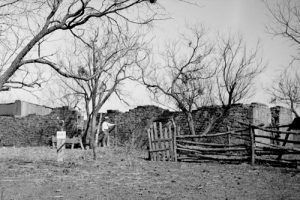 However, they continued to suffer from poor water supplies and because the frontier had moved westward, the fort was abandoned for the last time in September 1867. Forts Richardson, to the northeast, and Fort Griffin, to the southwest, replaced Belknap in the frontier defense system. For the next several years, detachments were occasionally stationed there to watch over the mail road or to control Indian uprisings, but after the subjugation of the southern Plains tribes in the Red River War of 1874-75, the fort fell into ruins and settlers dismantled it. 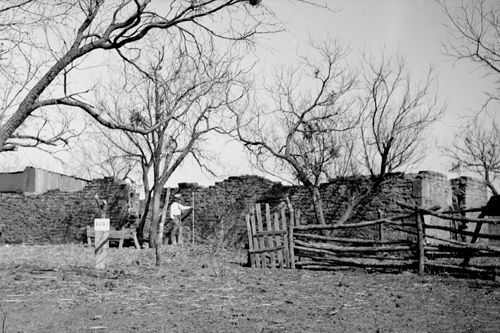 In 1936, during the Texas Centennial, the state, using supplemental Federal funds, began to restore the fort. At that time, only the magazine and part of the cornhouse were standing. The State restored these structures and reconstructed the commissary, a kitchen, two 2-story barracks, and the well. All of these are on the original foundations except the kitchen, constructed between the barracks. The buildings are of stone construction and have shingled roofs. The 20-acre site then became a county park. The site was designated as a National Historic Landmark in 1960. 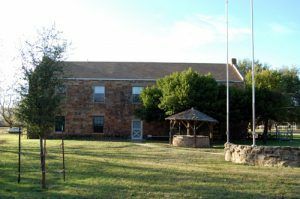 Today, the Fort Belknap Society administers museums in the commissary and cornhouse; and, jointly with Texas Wesleyan College, the Fort Belknap Archives of Western America, is located in one of the barracks. One of the former infantry barracks is now used as a community center. In the town of Belknap is a monument to Indian Agent Neighbors. 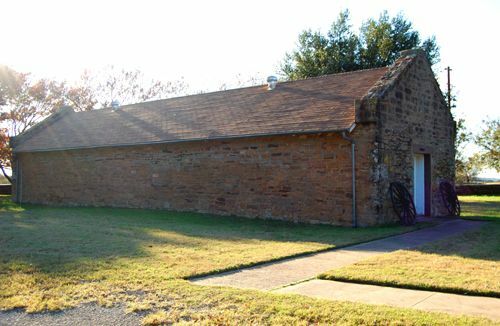 The fort is located in Young County, at the terminus of Texas Highway 251, about three miles south of Newcastle.